Looking at NASA’s documentaries we get a deep impression of an elegant universe in constant motion, expanding with no beginning or end. It is regarded as an awesome intelligence. Kabbalists have experienced this reality for millennia. The ancient Book of Splendor – the Zohar – is filled with such poetic descriptions. Both sources challenge the ordinary mind, leaving us bewildered and inspired to reassess our place in the scheme of things. Although most scientists today are not consciously searching for God, nor are they necessarily interested in self realization, they will often stand in awe before their discoveries. They certainly share this feeling with the Kabbalists. When we follow Einstein’s experience with the unknown, the existence of the mystic within the scientist is clearly apparent. When I hear Stephen Hawking describe his understanding of the cosmos, I am not really sure if I am in front of a mystic or a scientist. In these two contemporary giants, we can see how the mystical and scientific are uniquely entangled. As it should be. Those who are aware of the quantum effect of entanglement theory know that distant particles that were once together are still retaining a mysterious connection. These particles of different charge will be connected to each other regardless of the distance between them. What are the implications of such a profound discovery? If that is so, can we not also say that all that is in creation is connected in the same mysterious way to its Originator? The Kabbalistic perspectives of mystical giants, such as the second century Rabbi Shimon Bar Yochai, resonate with these contemporary scientific findings. Primarily written in Hebrew and Aramaic, Kabbalah has been secluded from mainstream eyes over the centuries, appearing and disappearing through history. Sometimes deeper levels of meaning need to wait for their right time to surface. Einstein called his observation of particles’ maintaining connectivity regardless of their distance “spooky”, because his rational mind could not validate it. Can this spooky connection also describe the nature of our longing and attempts to maintain a connection with our Creator? That we in some way belong to each other? In particle physics we see that, at a certain point, you cannot divide particles any further. Yet, an indivisible particle cannot be reduced to one singular reality; it is further observed to be a fuzzy vibration. As such it becomes a new, primal reality inviting us to explore more into its mystery. Likewise, it is deeply-rooted in ancient Jewish knowledge that there are four levels of reality inherent in the meaning of the Torah’s text. First is the simple literal level. Second is the level of interpretation. Third is the allegorical or clue. Fourth is the hidden, Kabbalistic level or secret. To this day the sacred Hebraic text of Torah, the Five Books of Moses, is written mostly in paragraphs with no punctuation or vowels. The absence of a period at the end of what seems to be a sentence is a source misunderstanding for translators. This is one of the reasons why a translation of Torah text can be challenging and sometimes misleading resulting in nothing other than a limited interpretation. The Hebrew language is a complex cosmology. As we will see, a single word can have multiple meanings, some of which contradict each other, and even a meaning that doesn’t seem to belong at all. This guides the follower to engage in an intentional struggle to confront paradoxes inherent in the core of our life. These contradictions fascinated the Kabbalists. The resulting friction wakes us up and helps us develop a more flexible, expanded mind, so that we may realize and consciously experience the purpose and meaning of our existence. What forces does a translator/commentator obey? In the 3rd Century in Alexandria, Egypt, the Five Books of Moses were first translated into Greek. This famous translation, the Septuagint, became the source of all pre-Modern versions of what is considered by some to be the Old Testament. While this might at first seem to enable the Torah’s wisdom to be spread broadly, a day of mourning was declared in Israel. An immeasurable amount of the holiness and wholeness of what the Torah meant to be has been violated. The vast opportunities of using the text to bring people closer to the Divine has been limited. The original text has the power to lead us in endless ways to realize the purposes of our existence. The core essence and potency of the Torah was further weakened when the “Laws of Life,” conveyed by Moses as higher states of consciousness or Da’at in Hebrew, became the laws of religion, “Dat”. In fact, the word “Dat” never appears in the entire Bible. With the drop of just one Letter, (Ayin), a different meaning surfaced and overshadowed the original intended meaning of Daat. The Hebrew language is a complete cosmology. Each of the 22 Hebrew Letters (ot) is viewed as a sign, wonder and energetic code which have captivated the Kabbalists’ attention to this day. As cosmic forces, the Letters are building blocks in the creations of the world. They are spiritual DNA. 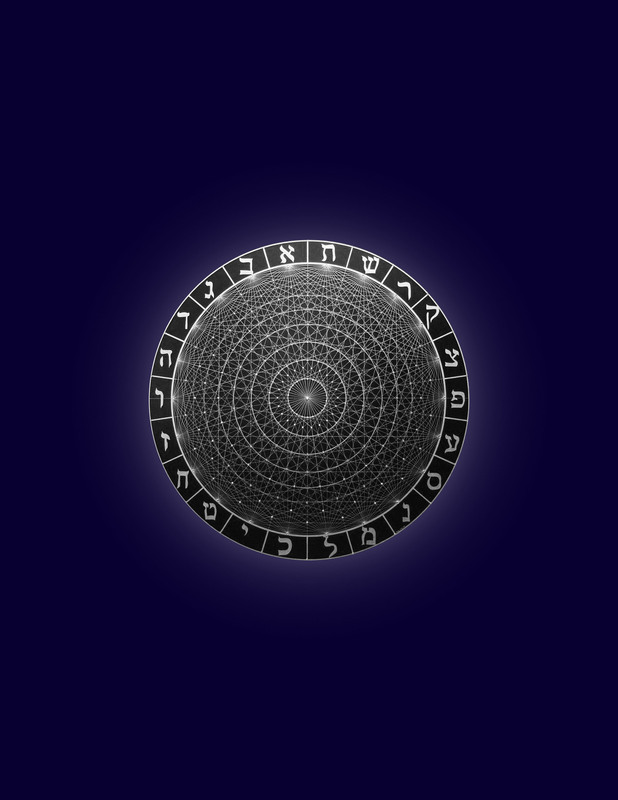 The shape of each Letter emanates vibrations to fulfill its specific mission on earth. Science, too, claims today that creation is nothing but vibrations; all matter is nothing but vibrations on different levels and densities. Just as we can divide particles and see how the tiniest indivisible one still contains vibrations that are yet to be explored, so is each individual Hebrew Letter. You can divide a sentence into words and words into letters but a Letter is never only a letter or an indivisible particle; rather, she too, living on four levels, has a complex and deeper reality waiting to be experienced. Accordingly, this reality of each Letter can be found on the inscribed page of the Torah. Each Letter is written in black ink and is called black fire (esh shechorah). The parchment upon which she appears is called white fire (esh levanah). The white space between the Letters, which is also the negative space, is the unknown waiting to be discovered. The black Letters are what is known, the positive space. This way the Torah is continuously unfolding, revealing Truth which causes and reflects change and development. In the 8th century the Masorites, Jewish scholars of Babylon and Tiberius who were influenced by Aristotelian thought, created vowels for the Hebrew text, thereby to unify pronunciation and meaning. Here, again, we suffer a tragic loss which we try to rectify. This is how the first word in Genesis, Brei’sheet, unconsciously or inadvertently, came to be translated as “in the beginning”, an idea that is commonly but not necessarily accurately held to this day. In fact, the Hebrew text does not indicate the word “the”, pointing to a single specific creation or time. As we shall see, this seemingly acute but definitely critical mistake, amongst many others, has caused the hidden levels to be inaccessible. Since there are no vowels in the original Hebrew text, verbs can freely move between past, present and future, as a language of truth ought to be, creating new realities and meaning on a continues basis. What is often overlooked is that this feature is intentionally built into the language, creating an eternal tense beyond time, one that is perfectly suited for Biblical stories. God still speaks to the people, they are still listening or not, wondering in the desert, experiencing the promised land of milk and honey, or struggling with how to align themselves with Divine intelligence. The Exodus is our past present and future. The experience of the cosmic promise that slavery on any level, will end with freedom is timeless. Verbs in the original text are beyond time. For example, the first line of Genesis is commonly translated as “God created” (barah), in past tense. Yet, since there are no vowels, it also can be read, “God is creating” (boreh), in present tense. The verb in the past tense indicates that the creation took place once-upon-a-time, while the verb in the present tense speaks about a completely original and innovative event, one that is going on forever, with neither beginning nor an end. Again, what forces do the translators obey? When we consider the first word, Brei’sheet, as the one and only beginning, which is a Greek idea, it suggests a God with a very fixed, static, distant Aristotelian character. An ideal and perfect God but passive and distant who has done “His” work and left. He is the watchmaker who, after making the watch, can walk away from his creation. Brei’sheet simply, literally means in a beginning or at a beginning or at first, initially or even “with wisdom” (b’rosh). There are other possibilities which will be mentioned later. But none of these permutations implies the “t-h-e” idea. The other creation events mentioned in Genesis chapters two and three further and clearly confirm that there is not a “single” event. One is creation of matter, and the other is the Creator’s breathing life into it. In all, creation is a moment-to-moment, ongoing seamless, dynamic movement that is unfolding all the time. God is constantly interacting with “His” reflection (creation) in a relationship of mutuality and reciprocity that implies Caring. Clearly, God, in the Kabalistic traditions, wants to be known by His creation and, so, establishes a partnership (brit) with “His” people. The Zohar also mentions other attempts at creation, ones that failed because of an imbalance between measures of compassion and judgment. Imagine our world still as an experiment that might collapse. Kabalistic sources mention in relation to creation that there are also worlds to come. This idea alone introduces a profound, new way to perceive the reality of Beginnings. At that time, it is said, the entire text of Torah will be composed differently; the sentences, vowels, punctuation and words will be in different arrays and permutations. Just as the four base units of DNA have millions of combinations, the 22 Hebrew Letters can be set in new arrangements of sentences using different vowels etc., thus creating new worlds. Science, too, has concluded to date that the universe is unfolding and expanding. It resonates with the ideas inherent in the fullness of the word “Brei’sheet”. Whether probing the stars, the earth or the human body, scientists present findings that are wonder-full. While not having any predisposed notions about the Divine, their observations confirm what Kabbalists have been experiencing personally yet with no way to prove it scientifically to others. The God who appears from the Kabbalists’ perspective is perfect in a new way. Not because “He” is distant and ideal, static and fixed. Rather, “He” is perfect because “He” is in motion, changing and expanding. This encourages a reciprocal relationship with the ones who seek “Him”. Kabbalists use the word “abundance” (shefa) when describing the response, care and love available in this new relationship. One of the names of God is “The Influencer” (ha Mashpiah, which is derived from the word “shefa”). This is so because, ultimately, the Divine wishes to be known by humanity. The word Brei’sheet, the Kabbalists observed, has yet another, even more fascinating meaning when read as “barah taish”. This literally means, “creates an offering”. Thus, the first word of Genesis implies that even before our world is/was created, the means with which we may respond with gratitude is inherent and already provided. Brei’sheet, as “creates an offering”, is our “means of returning”. This promises the possibility of maintaining harmonious relations between humanity and God. As the Kabbalistic Tree of Life shows us, the unfolding creative process, from Ein Sof or God to life here on earth, is a gesture of giving life to something new. Therefore, at this cosmic level, by Law, we have the privilege and responsibility to be in relationship with our Creator. It shows us our place in the bigger picture. Just like in the multiple meanings of the first word in Genesis, from “in any beginning” through and even beyond “created an offering-barah-taish”, the word Brei’sheet promises to move us from bewilderment to reassurance. She offers new perceptions about our place in a constantly expanding world and inspiring a renewed sense of hope and gratitude. To Kabbalists, God is beyond any gender and represents both masculine and feminine forces. Gilla Nissan was born in Tel Aviv, Israel, now living in LA. A poet, writer and teacher of mysticism and the Hebrew Letters. Posted in Artworks, Learning Opportunties, Poetry, Piyyutim and Prayers and tagged aleph bet, hebrew letters, jewish mysticism, jewish renewal, kabbalah, zohar. Bookmark the permalink. Jewish Renewal: Will There Be a Next Generation?